A week long break for the All Star game didn't manage to slow down the Pittsburgh Penguin offense. It didn't slow down the power play, and it certainly didn't slow down Sidney Crosby. The Senators had no answer for Crosby, who had a season high 4 points with a hat trick and an assist and the Penguins scored a season high 6 goals as they hung on to win a wild one against the Ottawa Senators 6-5. The Penguins came out flying in the first period and quickly built a 2-0 lead. Matt Cullen opened the scoring when he followed up on his own rebound and put the puck 5-hole on Craig Anderson. Minutes later, it was an Erik Karlsson blunder that allowed the Pens to double their lead. Karlsson tripped along the blueline, springing Chris Kunitz on a breakaway chance. Anderson made the save, but Sidney Crosby quickly tracked down the rebound and blindly centered the puck to the front of the net, where a streaking Kris Letang was able to track it down and backhand it into the open cage. Ottawa challenged the play for goaltender interference, but the officials allowed the goal to stand after determining that Patric Hornqvist had been checked into the goalie. The teams traded goals later in the period when Fleury was unable to stop a dump-in and watched Mark Stone shoot the puck into the vacant goal back door. Chris Kunitz was able to corral a blocked shot and put it between Anderson's legs before the goaltender saw what happened. It was a dominating period for the Penguins as they controlled the play, but the scoreboard didn't reflect this as the Senators managed to score with just 30.3 seconds left in the period. 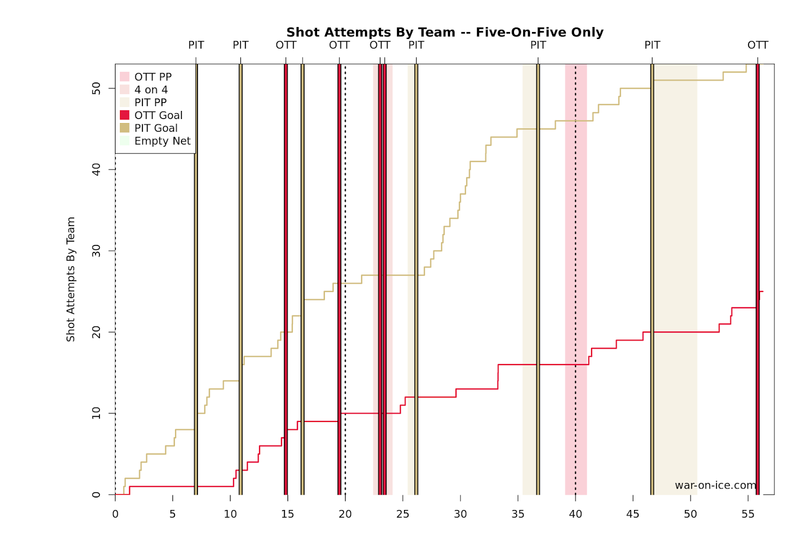 A turnover in transition allowed the Senators to regain the zone, and a screened Marc-Andre Fleury couldn't track a Chris Wideman shot that beat him on the far side. The Sens scored their second goal on just their fifth shot on goal of the game. The action continued in the 2nd period as the Senators scored goals 24 seconds apart to pull ahead 4-3. Tom Kuhnhackl took an embellishment penalty on a Jared Cowen hold, and Ottawa made Pittsburgh pay on the resulting 4-on-4. Fleury couldn't handle a blistering Karlsson slapshot from the top of the circle, and Jean-Gabriel Pageau put the loose puck in to tie the game at three. Moments later, Fleury appeared to have covered a Zack Smith shot in close, but Cody Ceci managed to poke to puck in before the refs blew the play dead to give the Senators a shocking 4-3 lead. The three goals in 3:55 could have been a back-breaking series of events, but the Penguins continued their resilient ways and quickly responded. Sidney Crosby made sure that the lead didn't last for long. The captain scored a pair of power play goals in the period to put the Penguins back ahead 5-4. The first came minutes after the team gave up the lead as a Hornqvist screen helped Crosby snap the puck past Anderson. The scoring settled down as the teams skated 5-on-5 before a Mark Borowiecki interference penalty put Pittsburgh back on the man advantage. The Penguins nearly scored earlier in the man advantage as Hornqvist chipped a rebound off the post, but they managed to convert as Crosby stopped a Phil Kessel centering pass with his skate blade and tapped it into the empty net, giving the Pens their 2nd power play goal in as many opportunities for a unit that has quickly become one of the most efficient in the league as of late. Crosby finished off the natural hat trick in the 3rd period when he redirected the puck through Anderson's legs to give the Penguins a 6-4 lead. The Senators gave the Pens a golden opportunity to ice the game with a 5-on-3 midway through the third period, but the Penguins weren't able to capitalize on the man advantage. The Senators cut the lead to 1 with 4:10 left in the 3rd as a Dave Dziurzynski shot clipped Ceci's knee to redirect past Fleury on the far side. A Mika Zibanejad high stick on Kuhnhackl drew blood and gave the Pens a 4 minute power play, but the Senators got an even-up call with 1:31 left to keep things interesting. Mike Hoffman rung a pair of shots off the crossbar, but that was as close as Ottawa would come to completing the comeback. The Penguins dominated possession in this game, managing 67.9% of the shot attempts and posting a dominating score adjusted 69.1 CF%. It was one of the team's best offensive and possession outputs of the season and made up for an uncharacteristic night on their back end. The win puts the Penguins just 2 points behind the New York Rangers for 2nd in the Metro with a game in hand and gives Pittsburgh a 4 game winning streak. They'll attempt to extend it further as they travel to Florida to take on the Lightning and Panthers on a back-to-back Friday and Saturday before returning home.